I know some people think it's a little silly to have all of these "National Food Days", but I am an absolute sucker for them! It's like you get mini holidays all year round! National beer day, donut day, ice-cream day, and pizza day are all winners in my book, but the mack daddy of all the days is NATIONAL ROSÉ DAY!!!!!!!!! It's happening Saturday folks; I'll most definitely be lounging somewhere drinking the pink nectar of the gods and probably over using #roséallday. I also just read this news article talking about Aldi's $8 bottle of rosé was named one of the best wines in the world! Would Postmates deliver a case of wine to my apartment door ya think? I just happened to have a bottle of Ruffino Sparkling Rosé in the fridge this weekend and decided to make an epic Strawberry Rosé Sangria...with rum...and hood strawberries. Could 3 things be anymore perfect together? I can't imagine a better accompaniment than this sangria to a day basking in the sun. This rosé is perfect on it's own, but sometimes you just want that little extra somethin' somethin', and a generous shot of rum will do just the trick. 1) Mix the wine, rum and sugar in a pitcher, stirring to dissolve the sugar. The amount of sugar you want to add will depend on how sweet your rosé is, so add 2 tablespoons first and then go from there. 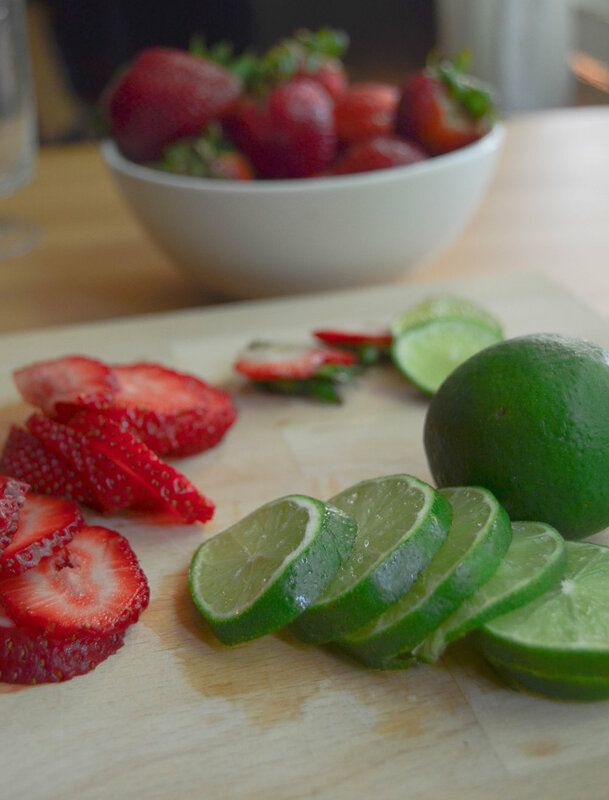 Then add the strawberries and sliced limes. 2) Refrigerate at least 1 hour and up to 1 day. 3) If you're lazy like me sometimes, you can just fill your glass with ice and sliced fruit, pour over 2 ounces of rum, an ounce of simple syrup, top with rosé and give it a good stir! 3) Add the seltzer/soda water just before serving if you want it a little fizzier.